The amount recovered is small compared with the $700,000 annual cost, but LePage officials say the effort deters fraud. Lori A. Boutot forged dozens of documents to get welfare benefits for more than four years. The former Oakland resident falsified where she went to school, where she worked, where she lived and who was watching her children. In May, Boutot was convicted of defrauding the state of more than $80,000. She was sentenced to 20 months in prison and ordered to repay the state, although restitution payments are unlikely, according to her lawyer. Boutot is one of 13 people who have been convicted or pleaded guilty to welfare fraud this year, and more convictions or pleas may be coming because of an increase in cases referred to prosecutors by a beefed-up investigative unit in the state Department of Health and Human Services. The referral increase, from 10 cases in 2010 to 45 in 2012, is championed by Gov. 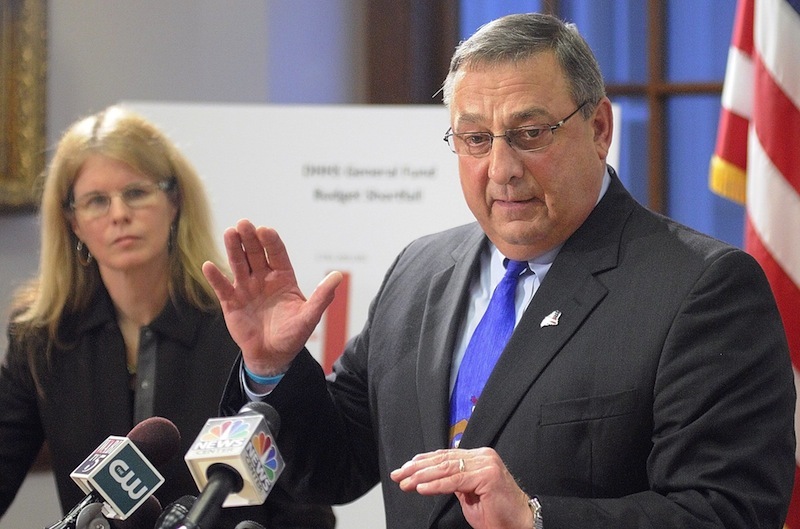 Paul LePage and Republicans, who say the principle and deterrence of the crackdown are worth the additional $700,000 annual investment in the fraud unit. They say the effort, combined with a sharp decrease in Temporary Assistance for Needy Families recipients, signals that the welfare reform policies they pushed in 2011 and 2012 are working. However, some are questioning whether the crackdown is more politically driven than reform driven. And, despite the effort, the number of successful prosecutions has increased more gradually, from eight in 2010, to 10 in 2011, to 15 in 2012. The amount of restitution that courts have ordered increased from $92,339 in 2010 to $104,341 in 2012. LePage has promised more changes, in an effort that supporters say lines up with public support for less spending and more accountability for programs designed as lifelines – not lifestyles – for the needy. The governor’s political opponents and advocates for the poor don’t dispute that fraud prosecutions are on the rise. HOW RAMPANT IS WELFARE FRAUD? According to data from the Department of Health and Human Services, 350,000 to 400,000 Mainers receive some form of public assistance, through services such as food stamps, cash benefits, heating subsidies and Medicaid, the health insurance program for the poor. The high demand for assistance programs and what has been a dearth of statistical evidence of welfare fraud make Hastedt question the governor’s elevation of abuse prevention as a priority. “It makes me wonder whether his focus on it … has more to do with making political points than actually improving a system and engaging in real reform that helps families get out of poverty,” she said. Nonetheless, the increased prosecution of welfare fraud has armed proponents and made it harder to dismiss complaints as anecdotal. There is still little national or state statistical evidence showing rampant welfare fraud. But the public remains suspicious, as evidenced by the 20 to 50 tips that the DHHS gets through its reporting hotline and Web service every week. However, the millions of dollars don’t come from prosecution of welfare cheats. Of the 13 people convicted of welfare fraud this year, the two ordered to pay the most in restitution are Boutot and convicted “Zumba” prostitute Alexis Wright, who a court found defrauded state welfare programs of more than $40,000. Other convictions or plea deals will yield much less, and four won’t recover any funds, according to data from the state Attorney General’s Office. All told, courts have ordered about $209,000 in restitution this year. They ordered about $104,000 in 2012, and about $176,000 in 2011. In 2010, the year before LePage was elected and Republicans won majorities in the Legislature, the restitution orders totaled about $92,000. In 2009, the Attorney General’s Criminal Division successfully prosecuted six fraud cases, yielding restitution orders totaling about $58,000. Much of that money is never repaid. Although restitution orders totaled about $431,000 from 2009 to 2012, the state has recovered just under $80,000 to date, although the Attorney General’s Office was unable to provide data for repaid funds for all of 2012. The meager returns don’t surprise William Stokes, the deputy attorney general who oversees the recipient-fraud unit. “In most cases, you’re not dealing with wealthy people when you prosecute recipient fraud,” he said. The “real money,” Stokes said, is in prosecuting health care providers that defraud the state’s Medicaid program, MaineCare. The office’s Maine Healthcare Crimes Unit takes on those cases and operates separately from the smaller recipient-fraud unit. In 2012, the Healthcare Crimes Unit initiated 13 court actions and recovered $26 million. The unit is staffed by several attorneys general, three detectives and support workers. It also receives federal dollars. The recipient-fraud unit receives some staff support and is staffed by two attorneys general, Leanne Robbin and Darcy Mitchell. Stokes said it’s difficult to calculate the cost of prosecuting a recipient-fraud case because the office doesn’t bill hours like a law firm does. Robbin earned more $93,000 in 2012 and Mitchell made $36,000. Both units rely on the DHHS for referrals. Referrals about providers haven’t been a problem, Stokes said, but the recipient-fraud referrals were of poor quality, as was the collaboration between the DHHS and the Attorney General’s Office. That began to change in 2011, said Stokes and Herb Downs, chairman of the DHHS Fraud and Abuse Task Force. That year, LePage and the Republican-controlled Legislature mandated that the agencies coordinate better. John Martins, a spokesman for the DHHS, said that before the change in 2011, some investigators operated under the assumption that prosecutors wanted only cases that yielded significant restitution orders. Stokes said such speculation wasn’t accurate, but a previous prosecutor did prefer referrals that could produce felony convictions. Now, the Attorney General’s Office meets regularly with the DHHS investigative unit, advising its investigators. The number of investigators has jumped from nine to 17. The additional eight investigators cost $700,000 a year. The starting pay for an investigator is $31,600 a year plus benefits, said Downs, who is now part of an investigative unit with a budget of $1.5 million. Despite the likelihood of meager restitution for welfare fraud, supporters say the beefed-up investigative arm is worth the additional cost to taxpayers. Martins said stepped-up prosecutions act as a deterrent. Also, Martins said, there has been a culture change in the DHHS. Awareness of abuse is at an all-time high, he said. There are more investigators, and the staff that reviews applications for state assistance is better trained to spot suspect applications. “When you’re doing this kind of work, it’s much more effective if you can stop the benefit from going out the door than having to chase it after the fact,” he said. Hastedt, with Maine Equal Justice Partners, is skeptical of that argument. “I don’t know much about criminal behavior … but my guess is that it’s far more likely to frighten people who are truly eligible from using a system that is intended to help them,” she said, because applicants could fear making mistakes that could get them labeled as welfare cheats. Still, Democratic lawmakers have tread lightly on the governor’s fraud crackdown, choosing to focus their opposition on changes that they say contrast sharply with LePage’s goal of lifting the needy out of poverty.